The “Get up to” wording means that if you wish to redeem say, 200,000 points for $300, you will have to bring $300 worth of merchandise to the cash, as once 200,000 points are redeemed, if you were short by $10 and had $290 instead, you will have lost that $10 of value. Be sure to take a look at your subtotal before redeeming to ensure you have a full $300 of merchandise. All week long, get 10,000 PC Optimum points for purchasing a Davids Tea $50 gift card. You will see the points in your account by March the 8th. 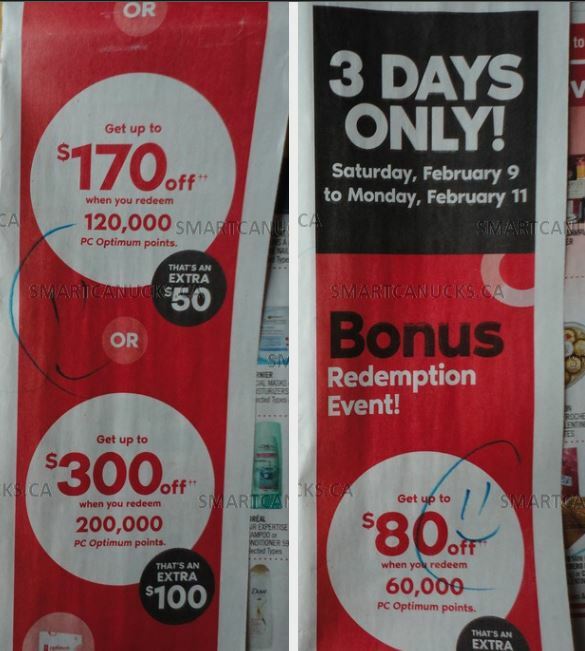 Click here to view the Shoppers Drug Mart Canada flyer valid February the 9th to the 14th.